With a growing interest in the anti-inflammatory and anti-cancer activity of Boswellic acids, Acetyl-11-keto-beta-boswellic acid (AKBA), Incensole and Incensole Acetate which are found in some types of Frankincense, the market for Frankincense products is growing rapidly. It is safe to say that all the literature and information that claims Boswellic acids are found in the essential oil of Frankincense are written and disseminated by essential oil companies who seek to boost their sales of Frankincense essential oils. It is also safe to say the studies one finds online at PubMed and other otherwise reputable sites claiming the essential oil of Frankincense cures cancer or contains Boswellic acids are written by a core of individuals who either own or work for certain well known essential oil companies. Please look closely at these studies and make your own evaluation. Don’t take my word for it. Take your time and read the fine print. Correct me if I am wrong. This is has become generally accepted misinformation, misleading at the very least and keeps us ignorant of how we can truly utilise Boswellic acids for our own health and wellbeing. It goes without saying that this information has also led to an increase in the unhealthy use of essential oil of Frankincense internally where it has served little function beyond straining and in some cases damaging our organs. There are no Boswellic acids in the essential oil of Frankincense. This recent increase in Frankincense essential oil sales has a far-reaching impact all the way back to the harvesters and the trees. Suffice to say, at the very least, our growing demand for the essential oil of Frankincense has led to serious overharvesting, contributing to trees dying much quicker than they can propagate themselves. We are going to lose them in a few short decades. (See the work of Dr. Anjanette Decarlo in Somaliland here-http://www.conservecalmadow.org/). We are also participating in a supreme waste of precious natural resources since the Boswellic acids we think we are getting are only present in the resin portion of Frankincense and discarded as valueless after distilling out our essential oils. If we are being misinformed, and the Boswellic acids are not present in anything other than trace amounts in the essential oils, then where do we find them, and how can we utilise them safely for their healing potential? To my knowledge and in my experience, there are 5 ways to utilise these healing compounds, easily and safely, for external and internal use. Using the whole fresh oleo gum resin, frozen, ground and as a powder. (See “How to grind Frankincense and Myrrh”). I take 1/4 to 1/2 teaspoon, 3 to 4 times a day. I find it a stimulating tonic and excellent anti-inflammatory. Studies indicate that when it is taken with oily/fatty food, our uptake and assimilation of the Boswellic acids is much higher. This could be fries, Avocado, salmon, oil and vinegar salad dressing or any other source of digestible fats that will help dissolve the resin portion and aid in its digestion. Making a fixed oil, oleo extract/infusion with vegetable oil, which will dissolve most of the volatile oils and resin. This is useful as a medicated oil for topical use and can be quite bitter if taken orally.. (See “How to make an extract of Frankincense and other oleoresins”). Using a solvent such as alcohol to produce a tincture or extract, which will capture all the resin-based compounds and essential oils. (See below). Washing out all the water soluble gum using heat and water to isolate a pure oleoresin. (Tapping into Frankincense and its Boswellic acids). Though this resin extract can be taken orally and does contain a high percentage of Boswellic acids, one has to wonder if a more holistic approach which includes the naturally occurring gums and essential oil that are in the fresh whole Frankincense might be of more benefit than an isolated concentrate…(Which takes us back to method number 1 above). I initially developed this method to facilitate the making of medicated cremes, salves and oils where the water soluble gum portion would have to be filtered out. Purchasing an extract of Boswellic acids. There are a few patented processes and products on the market that offer a 60%-65% concentration of Boswellic acids. Most are made by washing the material in both water and alcohol to isolate the pure oleoresin from the gum and foreign particles such as bark and sand. Due to the high cost of these extracts, they are more suited to internal use and not the preparation of salves, cremes or medicated oils. The word tincture comes from latin and means “to dye or colour”, referring to the menstruum, or the solvent liquid receiving the colour or character of the material it is extracting. Our English word, “tinge”, shares the same etymological root. The word Menstruum is rooted in Old English and Latin. From the word “Mensis”, it refers to the liquid solvent we use to extract the therapeutic compounds from plant material and its meaning is “a month”, not just any month, but a Lunar month which we see implied in the words menses and menstrual. This is important since Astrologically, the Moon “rules” and influences all things fluid, as seen in the ebb and flow of the tides most obviously. This knowledge can be put to good use when we are preparing high-quality tinctures and other fluid plant preparations. Tinctures offer us a convenient and effective method to extract and utilize the active compounds in medicinal and fragrant plants, and are just as useful now as in centuries past. Tincturing will separate the soluble, active compounds from cellulose, bark, starches and other non-active components. Though, in theory, different solvents such as petroleum distillates, Acetone, Glycerin, and Acetic Acid will also dissolve medicinal compounds, alcohol is considered now, as in centuries past, the “Universal solvent”, and still held as the best tincturing medium or menstruum available to us. Water acts as a solvent for water-soluble compounds only. and has no ability to preserve itself as a tincture. For this reason products collected via water have a very short shelf life. A tea can be considered a tincture of sorts as can an infusion or decoction, however, they are limited in the range of compounds they can absorb and by their inability to keep for more than a few days before succumbing to bacteria and moulds. Alcohol will mix readily with water and even when present at a very low percent, will help preserve a tincture. This means that an alcohol-water mixture can capture both the water-soluble and the alcohol-soluble compounds, and will preserve them all for future use. This is especially important since both Frankincense and Myrrh are not pure oleoresins, but oleo gum resins. Each containing varying amounts of water-soluble gum along with their alcohol-soluble resins and volatile oils. Gums which will not be dissolved by alcohol but water alone. These gums are not as well studied or understood to date and we may wish to include them in our tinctures and medicine for different reasons. Though the method of making a tincture from Frankincense is fairly straightforward, there are different types of Frankincense that can be used for different purposes and there are alcohols of varying water/alcohol ratios we can choose from for different applications. A high-proof alcohol that contains little water and it will extract mainly the volatile oils and resin from oleo-gum-resins and little of the water-soluble gum. An alcohol with more water in it such as a 40% alcohol, also termed, 80 proof, will dissolve and hold a reflective proportion of the water-soluble gum when one is working with Frankincense and Myrrh. We can control the percent of gum in a tincture by adjusting the percentage of water in our alcohol/water tincturing menstruum. Alcohol based tinctures offer us a simple, safe, effective and practical method to capture and deliver these resin acids and other healing compounds including the essential oils in their naturally occuring proportions. Tinctures can be used alone, to make compound medicines with other plant tinctures, or contribute to syrups, liqueurs, lacquers, liniments and other products for our health and enjoyment. Tinctures can also be a starting point for medicinal extracts and natural perfume tinctures or absolutes of fragrant plant material from which the alcohol is later evaporated. Below are 3 different types of tinctures one can make with Frankincense or Myrrh depending on our needs. An every day and all-purpose tincture and medicinal. Simple, straightforward and easily made at home. This sets out the basic method for the following alternative and more complex processes. It is these fundamental processes, combined with practice, knowledge, experience and vision that can lead to a mastery of the art and superior products that excel in colour, scent, shelf life and efficacy. In a clean resealable glass vessel place 1 ounce or 30 grams finely powdered, fresh Frankincense or Myrrh oleo gum resin. See the post, “How to grind Frankincense and Myrrh” to avoid delays and learning the hard way. A larger jar is preferred to a small one. A good volume of space above the liquid encourages a microcosmic environment where vapours will naturally rise with the ambient heat, condense, collect and rejoin your menstruum. Much as in Nature. You can of course, double, triple or quadruple this formula as long as you keep the same ratio. To the powdered oleo gum resin add a Vodka of your choice, unflavoured and at least 40% alcohol or 80 proof. You can use Brandy or even Whisky as long as it is unflavoured and with no additives. A higher ratio of alcohol to water will deliver more resin and less water-soluble gum to your tincture. 96% alcohol is about the highest percentage we can get and it can be used straight or diluted with water to achieve any % or proof you desire. At a ratio of 1:5, add 150 Ml. of alcohol to the powdered material. This is the standard acceptable ratio for tincturing dry plant material in most Herbal circles. Run a tiny bit of vegetable oil on your finger, around the thread of the jar, almost to the lip. This will ensure the lid is not sealed close by resin that seeps in through capillary action while you are shaking the tincture daily. Hand tighten the lid on the jar. Place in a relatively warm place. Shake at least once daily making sure all the material is dislodged from the glass each time. Continue the maceration for at least 1 full moon cycle, approximately 4 weeks. Ideally 1 1/2 or 2 cycles, and it can be left indefinitely with no harm. Always plan and time your tinctures by the moon, not by Solar days or weeks. Remove the tincture when you are satisfied no more colour is transferring from the material to the menstruum, (the liquid). There are many approaches to this process. Some require precise timing based on astrological and other esoteric calculations which lead to a higher quality product. However, as mentioned, we are dealing only with the basics here, so 8 weeks is a good minimum to yield an effective tincture and transfer the most important compounds to the alcohol. Pour your finished tincture through a fine filter such as a clean paper coffee filter set in a funnel. Fold the edges of the paper over on to the now exhausted material and press gently with the back of a spoon to squeeze out the last of the moisture while being careful not to rip the paper and allow solids into your clean tincture. Cover your filtered tincture and let it sit undisturbed a day or two to settle and sediment. Pour off or syphon off the clear liquid into clean sealable bottles or jars and label them accordingly. Make sure you have recorded the whole process and any pertinent information in a journal or formulary for future reference. We will choose to make this type of tincture when we desire only the resin and essential oil content of the Frankincense or Myrrh, with no water-soluble gum. We will use the purest alcohol we can find which is 95%-96% alcohol, branded as “Everclear” in the U.S.. This is likely the closest most of us can get to a food grade pure alcohol since is is very difficult for us to create an alcohol that is purer. This is partly due to alcohol’s hydrophilic nature and its ability to absorb moisture from the air. 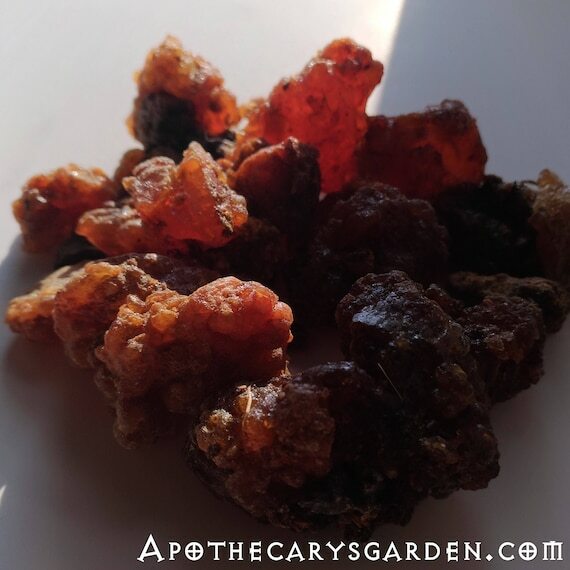 The resin and essential oil portions of Frankincense, Myrrh and other oleo-gum-resins have received most of our interest and research lately, and are known to be the source of many of their medicinal compounds. 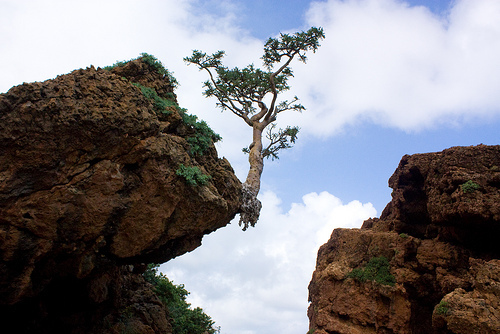 In the case of the Frankincense family, these are mainly the Boswellic acids, AKBA, Incensole and Incensole acetate which so far have only been found in Boswellia Papyrifera, B. Sacra/Carterii and B. Serrata. This tincture offers us the complete array of compounds in both the essential oil and resin portions of our oleo-gum-resins. It collects a negligible amount of water-soluble gum and is most useful in preparing liniments, and serves as a perfume tincture which captures all the aromatic compounds of the material and can transfer them easily to our perfume or fragrant product. The combined fragrance profile of both resin and essential oils is richer than that of the essential oils alone. In traditional herbal practice, tinctures are most often prepared in a ratio of 1 part dry herbal material to 5 parts menstruum. This can be used as a standard for Frankincense and for Myrrh tinctures used in the above applications. A more concentrated version of an oleoresin tincture that serves preparations such as the “Myrrh anti-fungal lacquer” and produces a tincture from which we can gently evaporate the alcohol to create an absolute or resinoid for perfumery, salves, cremes or internal applications such as gel caps and suppositories. Though we could, in many cases, use a 1:5 ratio of menstruum to material since we are going to evaporate the alcohol anyway, a 1:3 ratio performs as well and wastes less alcohol. The instructions are the same as above, but if we wish to create a solid product, after maceration and filtering our tincture, we set it out in a shallow pan, covered with a loose cloth and allow the alcohol to evaporate at a low temperature. Once a solid is available, we will collect it and store it in an airtight container to be powdered or melted and added to our products. This extract, if devoid of water-soluble gum, will dissolve readily in hot oils that may be used as the bases for salves and cosmetic cremes. Boswellia Papyrifera- A pure resin extract-Boswellic acids. can be produced using water or alcohol. There is something to be said for the concept of Holism, where we create products that are as close to their natural state as possible. Where we strive to keep our processing to a minimum, maintain the integrity, life force and “intelligence” of the original plant material intact. Keeping its components as close to the proportions and ratios present in nature is one step we can choose in this direction. We do this by matching the ratio of water to alcohol in our menstruum to the ratio of gum to oleoresin in the material. In Myrrh, Commiphora Myrrh, we find a consensus that water soluble gum takes up 65% of the material. We will prepare a menstruum with 65% water and 35% alcohol. These 3 Boswellia species all contain between 18% and 25% water-soluble gum so we will have to settle on a rougher estimate. With variations in climate, geography, and differences between first and consecutive harvests each season, no two batches of Frankincense are alike, and it is not realistic to expect any kind of precise foreknowledge of the constituents of Frankincense without sophisticated testing equipment on hand, which few of us have access to. For this reason we must proceed with an educated guess, a feel for the material, our intuition or whatever works for us individually, keeping in mind there are few true absolutes in life and that in these more esoteric pursuits, our intent is also an important part of the formula. Since the Ontario Liqueur board has started selling a high-proof, 76% alcohol Vodka branded “Spirytus”, I have found it most convenient to use it as the menstruum for holistic tinctures of the above Boswellia types. These tinctures are made as the others above. Lastly, to close a rather lengthy post, let’s share an Aqueous solution, tea. A traditional remedy for congestion, coughs and colds in the Arabian peninsula, at least in Qatar, and taken across the Islamic world as a pre-natal tea to increase intelligence and bravery of children as decreed by the Prophet Muhammad. Take by the teaspoonful during the course of the next day. Used for coughs, colds, congestion and other cold and flu-like symptoms. OK, back to work now where I’m preparing a batch of pure oleoresin extracted from fresh Boswellia Serrata from India. Lovely, fragrant, flowing, shiny, caramel stuff perfect for making salves and cremes that deliver Boswellic acids. You are invited to visit my online shop by clicking on any of the product photos in the sidebar. You might find exactly what you are looking for. Or perhaps you might find what you need. Remember to ALWAYS take clear notes! Hi Josh. You are absolutely right. A 1:4 tincture is a 20% solution and 1:5 works out to 16.66%. You can label your product either way. They are both correct. The ratio of parts is a more of a traditional method for herbal formulas. Thank you for this detailed post. I feel bad that we are wasting so many useful parts of the frankincense resin when we extract essential oil. I have a lot to learn and thank you for so freely sharing your knowledge. Can the frankincense tears be used for other purposes after making the aqueous solution (tea)? I wonder if then the oil-soluble components could be extracted or if the tears could then be burned / used in an incense heater. The residue from making the tea can definitely be dried and used as incense. Often, when the same resin is repeatedly used for tea and it is in a granular form it can be consumed. One assumes the resin portion with the boswellic acids can be digested and assimilated to some degree by the body. If you separate the gum portion through distillation or washing with hot water, the pure resinous residue can be used to make many oil based products such as medicated oils, cremes, salves and even moustache waxes. Thank you for this wonderful resource! Do you have any advice regarding dissolving Copal using oil or Everclear, for the purpose of tincture, oil infusion, or perfume? I am intending to make an oil infusion as well as a tincture of a mixture of copal, frankincense, myrrh (and a few other things). Would something like an almond/sunflower oil mixture be effective here? Thank you! You will have to do some experimenting for the simple fact there is a wide range of resins that are called Copal and each has its own unique chemical compounds. In general, most Copals will dissolve in alcohol and many of them will dissolve in part or whole in warm oils. I personally prefer Jojoba or Fractionated Coconut oil as carriers since both have an indefinite shelf life. Almond and Sunflower oils will oxidize and go rancid within a year or two, though adding a little bit of Vitamin E, (0.5%), will extend their shelf life. Thank you, that’s very helpful. I appreciate it. Hi Ramie. Yes! Benzoin is notoriously difficult to dissolve with alcohol. Even 96%. I have found that Benzyl Benzoate will dissolve Benzoin resinoid to a great degree and once you have a solution of the material in Benzyl Benzoate it will blend with essential oils and even alcohol. I don’t know what the maximum % of this solution can be absorbed by the other solvents, but it is the only method I have found thus far to work with the resin/resinoid as a perfume aromatic. Benzyl Benzoate is used as a topical treatment for scabies. It is relatively safe and can be found in most pharmacies. Hi Dan~ I’ve used another process that I learned from you to extract the oleo resin from frankincense–that of putting the tears in a pan of water on the stove and skimming the oleo resins off the surface as they separate from the water solubles and detritus. It’s an extremely messy process that requires a dedicated arsenal of pots and utensils that can never fully be cleaned, but I’ve done it a few times now. I’ve recently purchased an alcohol still–the Green Oil machine–and I’m curious what you think about using that to extract the oleo resin instead after reading now about the alcohol extract above. I’m a little wary to irreparably gum up my still –I’d be using that to boil off and reclaim the Everclear. Will it provide the same end-product as the hot water bath method? When you cook off the Everclear as you describe above, can you clean that pot sufficiently, or does it become a pot dedicated to that purpose? Thanks! 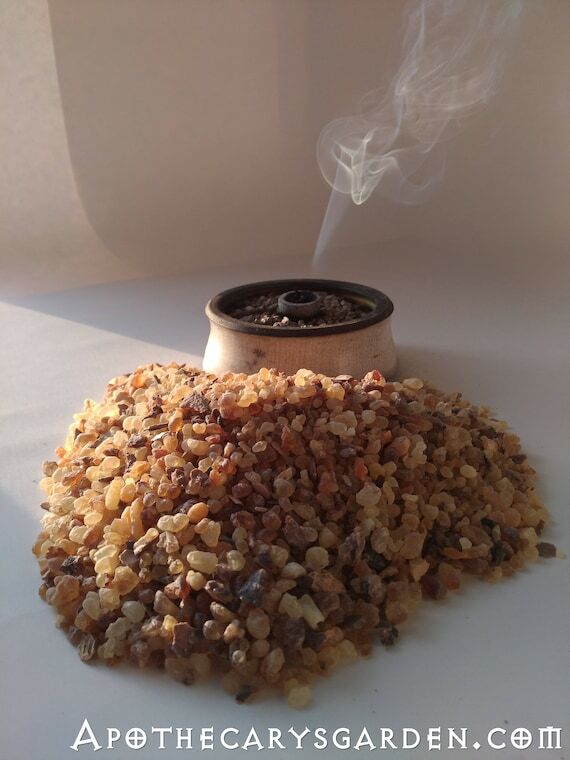 I have a quick question… Do I have to grind my Frankincense for an oil infusion? Yes. The finer, the better. Hi Dan…I totally love your website and all the information you give. I am curious if there is a recipe for using Frankincense and Myrrh together? Would I be able to grind them together and make these recipes that you have here? I thank you so much for any information. I believe Frankincense and Myrrh have a powerful synergy when used together and there are a few studies that support this. In general, I try to add a little bit of Myrrh to my Frankincense products and a bit of Frankincense to my Myrrh products when possible. In the case of tinctures, powders, teas and oil infusions which could be used for salves, this is quite easy to do. Often, when I prepare custom blends for customers, I add about 20% -30% Myrrh to Frankincense powders, tinctures and salves. Your approach is correct. You can grind them and process them together. I have a client who is a recovering alcoholic, and from what I can tell, an alcohol based extract would produce the properties that would help her most (inflammation from reproductive organs). If I drop the prepared extract into hot water to evaporate the alcohol before I send it to her, would I be removing any of the beneficial properties of the extract? Alternatively, I produced an extract into Olive Oil following your instructions sort of…I misunderstood and ended up steeping the menstruum into the oil for about 6 weeks. Needless to say, it’s kind of difficult to take orally, so she has been using it on her skin with some really impressive results against scarring. Hi Autumn. There would be no deterioration of the medicinal properties if you added the tincture to a hot water or tea. (A small portion of the volatiles would evaporate). Since writing the post on making an oil extract and suggesting it can be taken internally, I have transitioned my own practice to taking the powdered whole resin internally with food with good results. I find palatability and bitterness are not an issue with this method and it seems to addresses my own recurring and various inflammations well. I take 1/2 to 1 level teaspoon of finely powdered Frankincense 2-5 times a day with water. I pass the granules through a coffee grinder twice to get a very fine powder which may break down more easily in the GI tract. I let the powder air dry an hour or so between grindings to keep it from clumping. Encapsulating the powder is also an option with this method. Thank you for the information about your client’s success with the oil extract for scarring. Posting it here will allow others to benefit from it. Thanks so much for the direction. I’ll see if she’s open to taking capsules. Also, for anyone wishing to try the oil extract for scarring, I used cold pressed olive oil as suggested and I added a few drops of vitamin E oil as a preservative. I think I recall seeing you suggest that on a previous comment. I heated the oil as instructed, but then allowed it to steep for an additional six weeks. Because I’ve never made the oil extract correctly, I have no idea if that made any difference at all. Hello. I love you post. It is very informative and easy to follow. I do have one question, though. I was wondering if it would be possible to mix the tincture or resin with coconut oil instead of vegetable oil? I’d like to make a lotion with frankincense because of the benefits, but also for the pleasant odor. I think coconut oil makes a better skin lotion than vegetable oil. Have you done something like this? Would it be worth it to try it out? Thank you. It is difficult to blend an alcohol tincture with an oil, you can instead make an oil extract of Frankincense directly in your Coconut oil.lease see this post for instructions on making an oil extract of Frankincense from any fixed/carrier oil you desire. I have used Coconut oil to do this and it worked well. You may have to copy and paste the link to your browser. 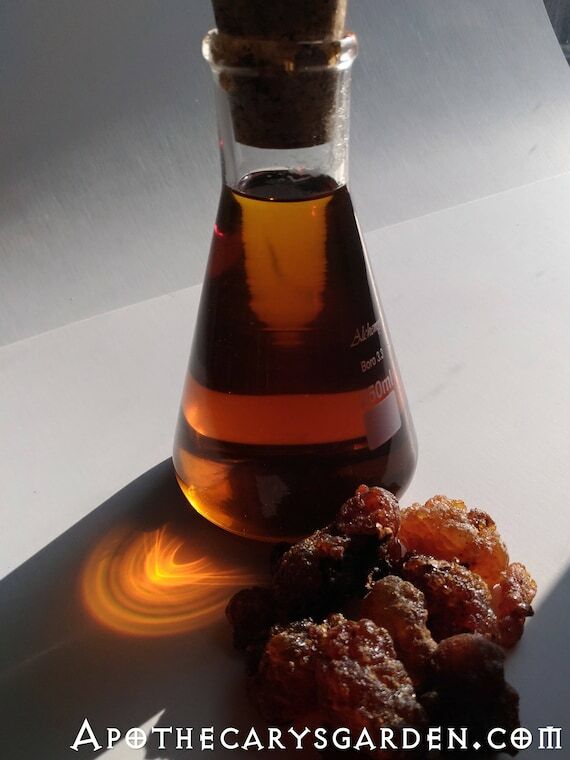 https://apothecarysgarden.com/2014/07/30/how-to-make-a-whole-extract-of-frankincense-and-other-oleoresins/, or type oleo extract in the search bar. I’ve made several batches of the oleo resin of Bsowellia Serrata according to your directions (and using your frankincense tears). I’m looking to make some suppositories to treat colon inflammation with the resin, but am not finding any good information on dosing –or whether this is even a good idea! I did find a commercially available suppository with Boswellia that is intended to treat prostate issues (Prostaflow). Any thoughts on this–and what ratio oleo resin to cocoa butter (which is a good suppository base) you would think would be best? thanks! I think it is a brilliant idea and the Frankincense resin extract is perfectly suited to it. I suggest using 2 containers in the water-bath when you heat up and blend the Cocoa butter with the extract. This will give you more control with the proportions. I find even a small amount of Cocoa butter can quickly change the consistency of the resin and it is easy to make your suppository material too soft. 5% to 10% may be all you need. I would spend some time experimenting to get the proportions just right, and have some crushed resin extract on hand in case you need to backtrack a bit and firm it up. Once you have a hot, mobile mixture of resin extract and Cocoa butter, the powdered extract should blend with no problem. If you measure, (Weigh), both materials beforehand, it will be easier to calculate percentages for the future. Though you can get a good idea of consistency by letting a few drops of your mix cool to room temperature and rubbing it between your fingers, the best final test of your suppository material may be to see how it behaves in your mouth at body temperature. If this was for my own personal use, I would combine the suppositories with oral doses of the powdered whole oleo-gum-resin, 1/2 to 1 level teaspoon 3-5 times a day with water, or make up some capsules of the powdered Frankincense which are easier for some people to take. There are very few side effects associated with using Frankincense, though caution is always wise when introducing something new to the body. Thank you so much for such clear information! I thought you might like to know that there is an exceptional alternative to Everclear – a company in Ashland Oregon makes certified organic alcohol at 190 proof, it’s called “Alchemical Solutions” … I won’t use Everclear, since I care about a high quality product! Thanks for the info on the Boswellias. I am in fact in Kenya, and have a patient ( I am a homeopath) who is Stage 4 Cervical cancer. I want to access some Boswellia Carterii Extract/tincture for her. I can get stuff sent from Uk quite easily but I am not sure of the quality of the tinctures I have seen (Mountain fresh company sell on Amazon). Do you have knowledge of good quality producers in Uk, or do you have any other advice for me. For sure, if I knew where to go in Samburu I could go up there and get the pukka stuff, direct from the tree, or from the Samburu women harvesters. Is processing done in Kenya? or I get resin and follow your instructions on your website? Thanks for contacting me. I don’t have any experience with UK suppliers unfortunately. I suggest you purchase some Boswellia Carterii or B. Papyrifera locally and make your own. Yes, just follow the instructions on the blog for the oleo extract, it is pretty straightforward. You likely have tincturing experience with alcohol, but let me know if I can be of help in any way. I have a batch of “Holistic” B. Serrata tincture I am very happy with. All 3 of these species have similar compounds and can be used for the same purpose. Email me at dnriegler@gmail.com so we can talk further and look at the logistics of getting you supplied. Help! Well I’m making a tincture of Pinyon pine needles and branches. I just picked it two days ago. There is still that green odor when I cut and pulverize the material. I have now drenched it in 151 proof grain alcohol, and that “green” smell is still coming through. Should I always dry out the pine needles first? Will that green smell always be there from now on? Since my experience lies mainly in working with the saps and resins, I can’t give you a definitive answer. Though it seems like an obstacle, it is also an opportunity to gain first hand knowledge and expertise in your craft by comparing the results of different methods. If you do make both a tincture from fresh and dry Pinion needles, you will have the opportunity to learn more deeply from the Pinion tree. More than this, If you are patient, you will gain first hand experience of how time can age, change and mature both tinctures which is invaluable. Remember to take clear notes and mark your bottles with all the pertinent information you can. Hi Dan, I can’t thank you enough for sharing all your knowledge and recipes with the rest of us. I am inspired by your philosophy of sharing our gifts with others. I have enjoyed reading about your travels to Kenya and the ways you want to help the people who work so hard, without who we would not be able to benefit from the beautiful gifts nature provides. I have some beautiful Frankincense tears (Boswellia Sacra Hougary from Oman) that I want to extract the healing benefits from to be taken internally. It is mainly for my daughter who is 13. Would it be best to take as a tea or an oil extraction? p.s. I ordered your chest rub for my 83 year old mother. She is awaiting its arrival and I will let you know how it works for her. Hi Mary. The Spruce chest rub has performed admirably for a couple of decades now. I would love to hear if it was of benefit to your mother. Regarding the frankincense tears, they are traditionally used as a tea or overnight infusion. If you grind them up fine before infusing them in hot water, you will get more out of them and might be able to run them through hot water a couple of times before they are depleted of beneficial compounds. Hi Dan, Thank you so much for the tip of running it through a few times. Sounds like I would have been wasting some good medicine only using it once. I am learning everyday. Thank you again for sharing your knowledge with the rest of us. You’re the best. Good luck with your new and worthwhile projects. Look forward to hearing more about them. I so apreciate your willingness to share such extensice knowledge. I have some frankincense tears that I’d like to work with so these posts are invaluable to me and infact, extremely rare to find elsewhere. My grandmother used to give us tne tears to chew in place of gum as children but she never told us exactly why and I do chew it sometimes but I believe there are easier ways to get larger doses. Thank you for visiting. The easiest way to larger quantities of Boswellic acids into your system is to powder the fresh oleoresin of Frankincense Serrata, Papyrifera or Sacra/Carterii and take it with water. Here is a link to a post with instructions on how to easily powder both Frankincense and Myrrh. I take 1/2 teaspoon of this powder 4 times a day. I mix it in my mouth with a sip of water to break up any lumps and wash it down with more water. Likely an easier method, is to place a half teaspoon of powdered Frankincense in a cup , and using tap water. make a Roux. Add a few drops of water and make a thick slur, then add water to it when all the larger pieces have dissolved. Something to keep in mind is that you must keep the powdered Frankincense in the freezer between uses or else it will solidify and you will have to grind it again. Thanks again Dan. I will definitely be grinding my own tears and taking the powder as you recommend. Cheers! Hi Michael. Thank you for your kind words. I am currently in Canada till the middle of December when I will return to Israel and spend some time in Ethiopia. 2016 is still unwritten for me, but I would be happy to talk further about meeting you both and see if we can find a time and a place that works for us. Please email me at dnriegler@gmail.com and we will continue this conversation into the new year as events unfold.